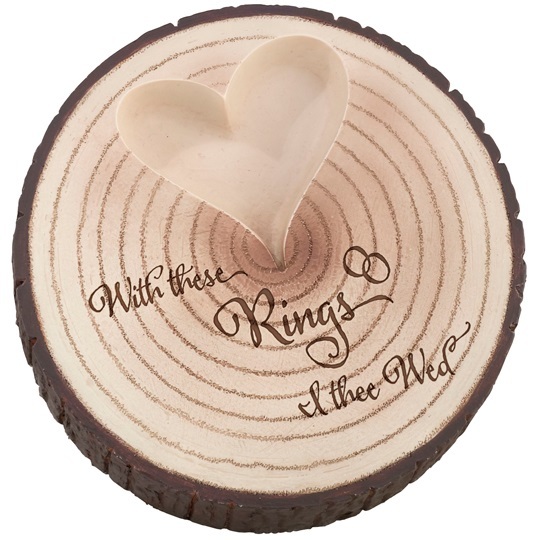 This Resin Tree Trunk Ring Holder is one of the most innovative wedding products we’ve ever seen introduced in more than two decades. It’s perfect as an alternative to a ring pillow, or if you have two ring bearers one can carry this adorable tribute to the natural beauty of the outdoors – and your love. Imitating a slice of wood from a tree which shows the tree’s age rings, a heart is “carved” into it to hold your wedding bands. The words “With these rings I thee wed” appear beneath the heart, accompanied by the joined rings symbol. The ring holder has a 5-1/4” diameter and is 1-1/4” deep. The heart is 2-1/2” wide and ½” deep to safely hold your rings. After the wedding it can be a daily reminder of your wedding day resting on your dresser or nightstand, holding jewelry or other small valuables. Looking for more alternatives to a traditional ring pillow? Check out this Wedding Horseshoe, found among many other unique Rustic Wedding Supplies.